It has been a long time since I thought about the basic properties of X-Ray tubes in graduate school. But I stumbled over an effect the other day that reminded me of one of these properties while using my new digital x-ray system. 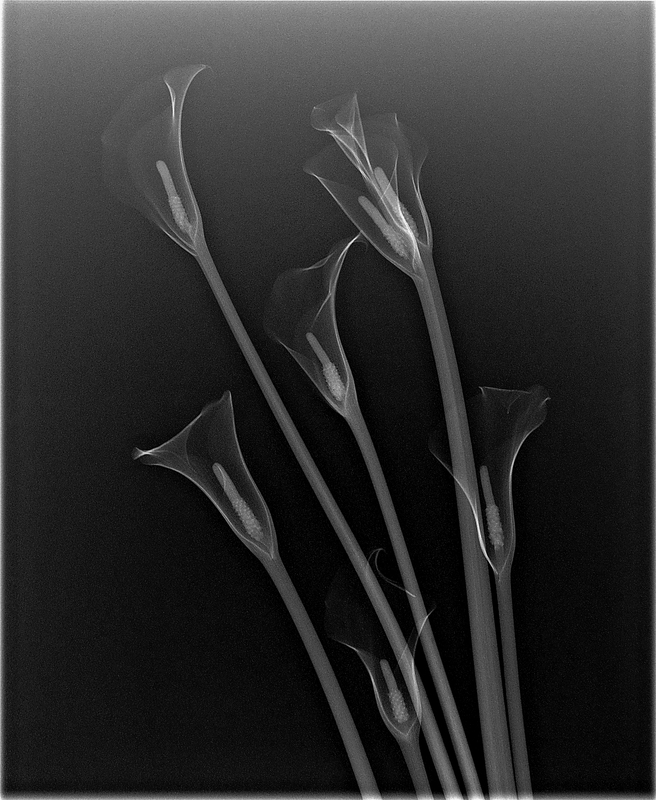 When I looked at this x-ray capture of six calla lilies, it was immediately clear that the system had operated in a way I had not entirely expected. 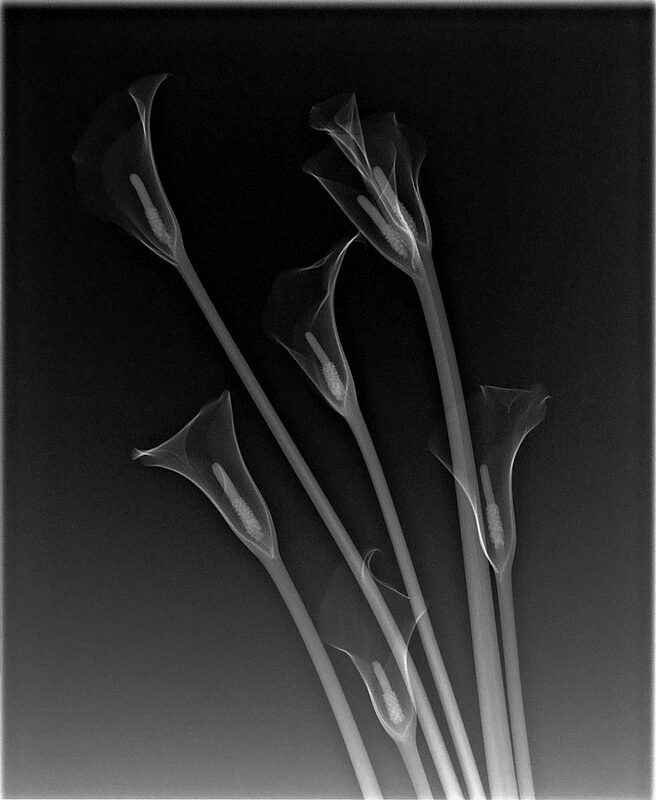 The background of the calla lily x-ray shows a gradient of deep black values at the top of the image ranging to intermediate gray values at the bottom. This was surprising. At first I suspected a problem caused by the sensor. But after a little reflection, I realized this was not the case. It was not a bug, it was a feature ! 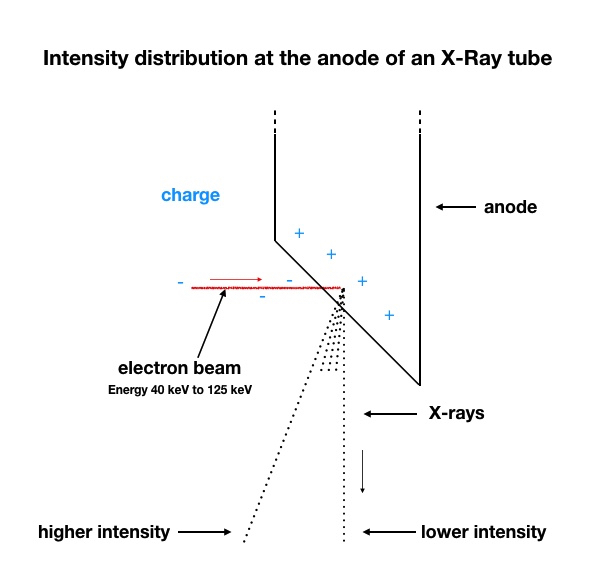 Darker values in an X-ray film exhibit higher intensities of X-ray photons. Lower gray values mean lower intensities. Reading a bit more thoroughly about properties of X-rays and their production, the reason for the phenomenon became apparent to me. As the image of calla lilies shown above demonstrates, the distribution of X-rays emerging of a X-ray tube is not homogenous. The path of the electrons is about 6 – 8 cm long. About 1% of the braking energy in return is transformed into X-rays. 99% is heat production in the anode. The most common construction type of X-ray tubes in the medical diagnostic field is therefore constructed with a very rapid spinning anode to expel the heat. The focal point on an anode is not a mathematical point. It is more like a circle (an even close model is an ellipse with a diameter of about 4 -5 mm). After electrons have entered the anode material and are slowed down, X-ray radiation leaves the edge of the plate. As the anode has an edge formed as an inclined plane, some X-ray photons can move freely, others have to pass a little more through the material of the anode. The longer the path of the photons through the anode is, the weaker the radiation’s intensity and the less is the sensor black. This effect of variable recording of photons by the anode plate is called „anode heel effect“. You can find more information on this topic in a Wikipedia article. The described gradient on an X-ray exposure can be used creatively. Before looking at these creative possibilities, note that it is easy to use post-production tools such as Photoshop to compensate for the gradient. Medical diagnostic digital X-ray systems are already using something similar to compensate for the gradient. Using the gradient that is generated creatively means taking control of the process. For example, by rotating the composition shown above by 180 degrees and exposing it a second time you get soft contrast in the calla lily blossoms and a “hard” contrast in the rendition of the stalks (see image below). For comparison, in the medical field an appropriate exposure would use the higher X-ray photon intensity at the bottom for structures that are more dense on one side only (for example, the heel of the foot). Note that acquisition (x-ray exposure) and post-production were done equally for both X-ray exposures ! Any rotational position can be thought of to integrate this effect in an image. The only limitation is the X-ray lighting area.